My sophomore season of being a triathlete officially started Sunday morning at Shawnee Mission Park. Being my 2nd season it also means participating in races for the second time. Typically you can compare running races fairly easily because a half marathon is always 13.1 miles. Yes, you have changes in elevation, weather, and routes but you can generally compare them. There are many inconsistencies between triathlon events the compare one from the other. You can rarely find triathlons that have the exact same distances unless you are paying for an event like a 5150, half ironman or full ironman event. 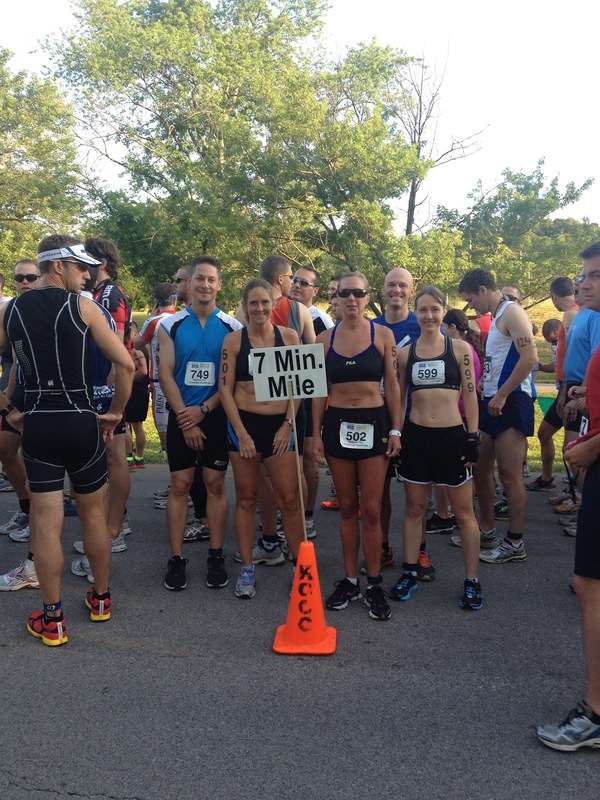 In 2011, the KC Corporate Challenge Triathlon was my second triathlon of my first year in the sport. In 2012, it was the first triathlon of my second year in the sport. Poetic, no? Truth be told, I had no clue what to expect because I've probably spent a quarter amount of time in the water and bike saddle this year than I did last year. I knew my running would certainly improve though. Last year I completed the KC Corporate Challenge Triathlon in 1:03:56. I at least wanted to see an improvement of that time but knowing I hadn't trained for it, I would take what I could get. I had an ambitious goal of under an hour but again, no basis for that. 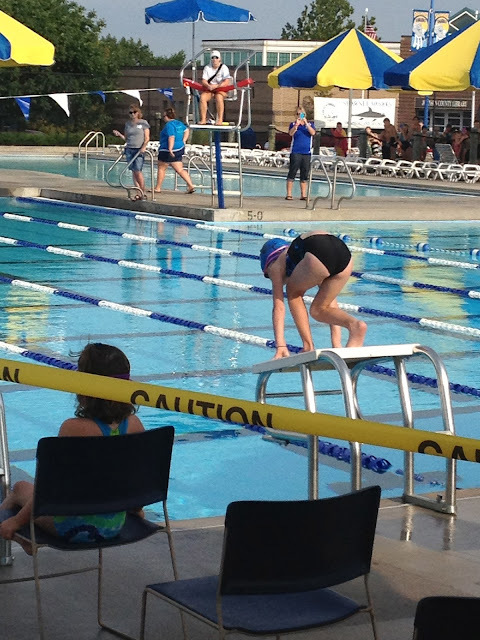 I'm still in marathon training mode, so I did 5 easy miles on Saturday and spent the morning watching my 6 year old niece compete in her first swim meet! It was so much fun! 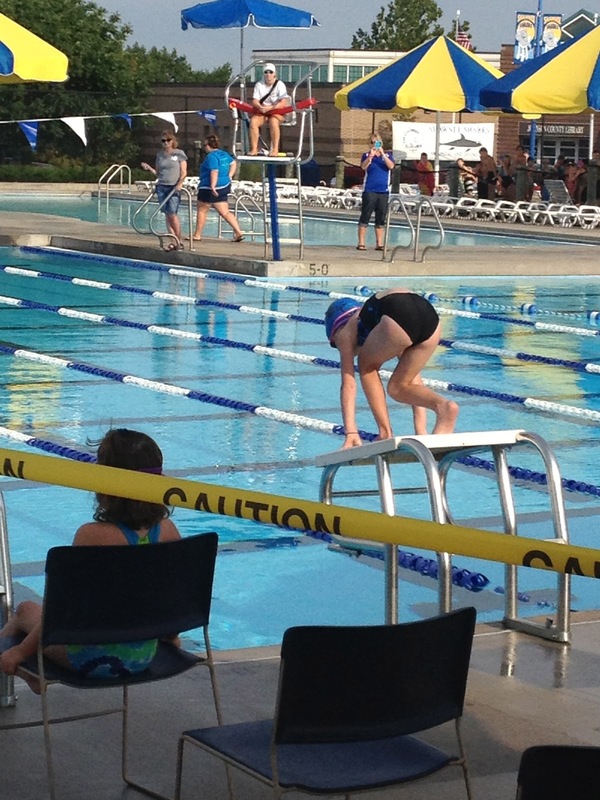 Ella is in the middle doing the backstroke. Yeah, I have a lot to learn from her! I asked for some tips and she recommended keeping my head down in the water. Very good tips. We went up to northwest Missouri near Maryville for a family reunion where we almost got blown away by an oncoming storm. I spent about 15 minutes holding down a canopy from flying into the next county. We arrived home around 10pm and I spent about 30 minutes packing up and then bedtime. I woke up to a sick wifey, so I took off for Shawnee Mission Park around 5:30am on my own. My company's Corporate Challenge Triathlon/Duathlon coordinator Denise parked right behind me. She had carpooled with Bryan, both were participating in the Du. Another DST associate showed up while they were getting unpacked and I eventually took off on my own to get my rack position. It's first come, first serve. The organizers changed things up this year and gave timing chips and TriTats in the packet, so I didn't even need to do anything other than setup my transition area before the race. I talked with a handful of other associates in between bathroom stops (using the flush toilet by the marina and not the 10 or so pit toilets). I found Kristen on the way back and we chatted with our Triathlon Team. The swimmer on the team is Doug Hayden who coaches a Masters swim class in North KC. I plan to take his class this offseason as I prepare for next year's season. Kristen and I took off for a warm up run but I noticed it was almost 7am, which was the start for the Duathlon... Kristen's event! My wave didn't start until 7:35 so I was able to get a mile or so jog in and still get back in time for the start. I snapped this photo of a bunch of DST associates ready to run/bike/run. They just look fast. Surprised I could catch them on my camera. Eventually I made it back to my transition to down a Gu packet, grab my swim cap and say good bye to corrected vision for about 40 minutes. I do have prescription goggles... the best prescription goggles about $5 can buy. I caught up with Austin while getting into the water, he is the other 30 - 39 male age group competitor for my company. He and I met up for a couple Open Water Swim practices the previous weeks. Triathlons at Shawnee Mission Park require participants to swim from the marina to the beach, which is maybe 50 meters. It's a perfect warmup swim. Not too long after we were herded over the timing mat and back into the water on the other side of the beach for our start. I haven't spent much time water... Maybe once a week for the last 6 weeks (with the last three being at Shawnee Mission Park Open Water Swim practice). I lined up conservatively about 3 rows back and on the outside. It wasn't a huge fight the entire time but crowded. I was still able to get in a good rhythm though. Sighting was pretty hard after the turnaround due to the sun but I somehow managed to be perfectly positioned for the exit. I swam until I hit ground and took off. I did peek at my Garmin and was happy to see it under 11 minutes. My time was 61 seconds faster this year, which is funny because I've probably spent 20% the amount of time in the pool since January. Huffing and puffing, I easily found my bike. I don't remember having any problems. Instead of racking up close the to bike exit, I racked in between the swim entrance and run exit, which was only 4 racks away from the bike entrance/exit. I thought it was a good spot even though you probably have no way to visualize what I'm talking about. My mount was pretty piss poor but that's ok.
1st Lap - Just like swimming, I haven't spent much time on the bike. I decided to follow the strategy of trying not to blast the downhills and save the legs during the 1st lap. I did work on keeping the speed up during the flats of the second half of the loop. 2nd Lap - Strategy was was to hit the hills a little harder and blast the downs. I do GPS tracking so friends and family can "watch" me online. On one of the downs I decided to give them a little show and hit 45mph since I had just finished an up hill around 8mph. Nearing the end, I peeked at my clock again and noticed that I was at 23 minutes and realized I was set for finishing under 30 minutes. I did a flying dismount and it worked perfectly. The only thing that was wrong with it is the guy at the dismount line wasn't yelling at me to dismount. I guess I wasn't going fast enough. Overall a really good time for me. 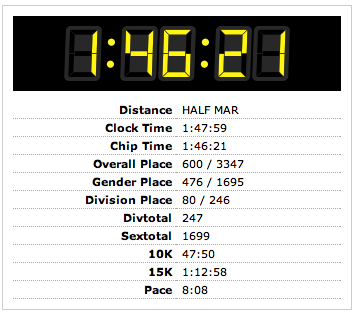 Over 3 minutes faster than last year. Last year I had the special laces that don't requiring tying the shoes so my time suffered a little. I think my racking position was pretty optimal because I didn't have a long run to the run start. I just noticed something as I was proofing my post. I NEGATIVE SPLIT THE RUN! 7:44, 7:26, 7:21 (pace for last .4). Pacing off the runner in the first mile was probably beneficial!! I saw the clock tick at 1:34:04 and since I had started 35 minutes after the first wave, I realized I had hit my top goal.... Under an hour! I was pretty amazed by this. After a couple disappointing races, I was glad to hit an arbitrary goal that I had no basis for setting!! Why not be happy! While I bested last year's time by almost 5 minutes, I did not fair so well in the rankings. I was prepared for this since last year the Corporate Challenge Triathlon was the same day as Ironman Kansas 70.3 (which is where Austin was last year). I knew competition was going to be much more fierce this time. So a much better time. My overall rank was improved but those in my age group must have been doing IM Kansas 70.3 and the people replacing them just went as fast. Team DST.... well, most of them. I'm in the back in the white visor. Always my favorite photo.... the one showing the underwater rescue boat launching pre-race. What were you thinking it was? Me racing my nephew Sam. Showing him how to cheat at the start a race. I'm a bad influence. He caught me in the end. Notice the storm coming in? Marathon training has literally started with a bang! I participated in the KC Corporate Challenge Mile Track Meet last night. Not necessarily the most conventional day 1 of an 18 week plan, but these Corporate Challenge company coordinators can be rather pushy convincing when it comes to participating in events. Continuing the theme of unorthodoxed training, my last three runs have been at races -- Amy Thompson 8K, Hospital Hill Half Marathon, and now Corporate Challenge Mile Track Meet.... all within 8 days. Last week I was also fighting off a bug so I tried get plenty of rest before Hospital Hill and missed my AM workouts. I did get a Swim/bike in last Tuesday evening at Shawnee Mission Park with Mark. That puts me almost two weeks without the pre-dawn sweatfest. That will be changing real soon. While running a hard mile three days after running Hospital Hill probably was not the smartest, I'm glad I did it. Not from the corporate civic duty but from a checkpoint of my fitness. I really have never ran a timed, single mile before. I really didn't know what to expect. If you have a time goal over the course of a half marathon, you can generally correct a missed split. That's not easily the case in a mile. Plus you are running near maximum effort the whole time, that's great if you know what that is. So I targeted some splits to put me in close to 6:00 minute pace. Something like 1:33, 1:31, 1:29, balls:out. While I did wear my Garmin, I'm not trusting the split data on there because it clicked off the mile about 9 - 10 meters before the end. I did try to calculate the splits as I ran by but, let's be honest, I don't remember much of the mile at all. It's a blur. I remember the sound of the start gun firing and then focusing on the track so as to not fall on my face. I do remember my first couple splits were pretty close to planned but even being off by just a few seconds adds up. What I do remember is I started to pick-up the pace with 300 meters to go and then faster at 200 meters to go... and then with 100 meters to go I had lost all control of my legs. They were doing things I never thought possible as I redlined at 4:15 pace (considering my previous comment about trusting the Garmin data). I would love to see a video of my finish because I bet my legs looked like the Roadrunner. They felt like they were moving in circles and billowing clouds of dust. I started picking people off and then I caught two guys that I apparently provided a bit of motivation and they kept with me stride by stride and finished a step in front of me. I patted their backs, congratulated them, and then went on the hunt for my breath. It had been replaced by the taste of blood in my throat. I spent the rest of the evening coughing at cheering on my coworkers until about 9:15pm. Kristen was running the mile for the company and she beat her expected time! I have one more Corporate Challenge event left, the Triathlon. I don't think I'll do as well as I did last year since I'm not spending much time on my bike/swim disciplines this year. In fact, this may be my only triathlon for 2012 simply because I am not willing to devout the time to swim/bike as I would like in order to compete. I do plan to continue the Shawnee Mission Park Swim/Bike sessions each week for cross training. I'm planning to spend both weekend days on running so little time for cycling. I registered for Hospital Hill about 2 days after last year's Hospital Hill event. They had announced that medals for the 2011, 2012, and 2013 events would fit together as a puzzle with the 2013 event being the 40th anniversary of Hospital Hill. I couldn't resist getting the second piece of the puzzle. I've had a slow then hard approach to training for Hospital Hill this year. Coming off of low volume months of February and March and a lingering knee issue, I took April as a slow base building month. Slow as in I was running 9:30 - 10 minute paces the entire month. Once May arrived, I started adding in some speedwork once my knee (and everything else) could handle it. This plan has worked marvelously as I did not have a single knee related issue or any injury during and after Hospital Hill. While waiting until May to do speedwork may have hurt my time a bit, in the long run it will be much more beneficial. Last year they added a full on Health Expo to Hospital Hill and it continued this year. Packet pickup was smooth. Bib, Shirt, Socks, Reusable bag, easy enough. 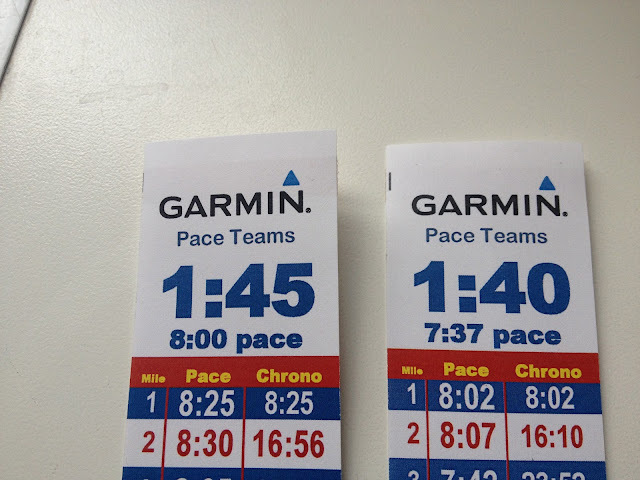 I headed over to the Garmin Pace Group booth to pickup a pacing band. I grabbed two, 1:40 finish and 1:45 finish. Yes, I was still undecided; however, I wanted ensure I could get in the 1:40 pace group so I went over to the "Solutions Desk" and asked to move up to Corral "A". I told the lady I wanted to be with the 1:40 pace group and she told me I was "right where I wanted to be", which I was pretty sure was wrong, but was late to getting back to work so I just left it. When I registered last year, I must have entered an expected completion time based on the 2:00 hour finish for 2011. Oops. On my way out I walked by the Andrew J Somora booth when I heard someone call my name. It was an long-time friend Jenny who was working the booth (and I really do mean long-time friend, I've known her since I was born). She's helping her best friend put on a 5k walk/run in October to support Colon Cancer Research. Her friend lost her husband to colon cancer last October and they started a foundation to raise funds and awareness. TKB and I are signing up and trying to convince my parents to do the walk. You should too! While I knew the weather was going to be perfect, I didn't want anything else to blame for my performance if it was sub-par. I had a good bowl of pasta but, frankly, I had been eating carbs since Wednesday to slowly increase the glycogen levels. My biggest decision was still to be made. Which pace group to follow? Looking at the 1:45 and 1:40 splits, the average 8:00 pace for the 1:45 seemed very doable so I chose 1:40 (7:37 average pace) to give myself a challenge. Since this is my third year of HH then if I'm not there to challenge myself, then why am I there? In addition, I figured having the pace group would push me through the struggles of the hills. It took me a little while to get to sleep. I was pretty nervous about this run. First, I was putting quite a challenge onto myself with the 1:40 group AND it was the first time I really felt like I was "racing" the event to meet a time goal instead of running to "get it done". Got up at 5:00am and made my breakfast. I slept fairly well considering the nerves. As usual, took my pre-race shower to hold off the Scotty-funk as much as possible. It's my pre-race coffee, I guess. TKB and I took off for the race around 5:45 or so to try to get a decent parking spot and take care of those pre-race necessities (port-a-pot stop, warm-up run, port-a-pot stop, final pre-race nutrition, port-a-pot stop, etc). TKB and I met up with Joe VI, Lauren and Joe VII. Lauren was running the 5k, wearing her "Pregnant, Not Fat" bondiband. She's about 7 months pregnant. So if Baby Jeppson keeps up the Hospital Hill Runs, that will be one more than years she is old participating. Joe and I moved over to the starting corrals around 6:50. Just as I surmised, the 1:40 group was in corral "A". I hung out in that corral with Joe VI as he flip-flopped between starting with me or starting in "A". I kept urging him to start with the 1:40 and leave me behind. I believe he was concerned that I would catch up to the 1:40 group and, therefore, beat him. I assured him I was going by the 1:40 wrist band and he finally moved up to the pace group. I have no aspirations to race against someone else at this point, I'm focused on time. If he started with me he was going to have more trouble catching up with the 1:35 pace group as that was his "ambitious goal". The clock clicked 7:00am and Joe VI was off. I was at the front of Corral "B" and there were definitely some people that don't understand the corral system as they took off past the timing sensors and then stopped when the emcee barked at them. Oops. A few moments later, we were off! I always go out too fast and this was no different. I kept forcing myself to slow down and I finished mile one 30 seconds faster than I should have. I honestly thought my watch was broken when it read 7:00 minute pace and I felt like I was walking. The first mile does have a small hill but it's mostly downhill. Miles 2 & 3 have nearly 200 feet of elevation gain, so I kept the pace right on target. It was at about mile 4.5 that I realized I missed mile marker 4. Normally this isn't a big deal but I had a specific pace goal and was trying to match specific mile splits; therefore, I turned the auto-lap function off on my Garmin. I was manually hitting the lap button when I crossed a mile marker. It is extremely difficult to run a race as officially measured. A course is measured with the shortest route possible in mind. Think of someone laying a string from corner to corner or straight through a windy road. Since I'm not going to be able to run that route with people and pot holes to dodge, I should still adjust my pace to match those mile markers. It may take me 1.05 miles to from mile marker 3 and mile marker 4. If I need to run that distance in 7:30 minutes, then I need to run the 1.05 miles in 7:30 minutes. Clear as mud? Why would it take me the extra .05 miles? Weaving through people, going to the other side for an aid station, gladly giving high five to some familiar or unfamiliar faces in the crowd. Who knows, who cares, it's (a runner's) life. So mile 3 was supposed to finish in 7:47 and mile four was supposed to be 7:12. So I just made sure I finished those two at an average of 14:58 (which was the total of the two). I hit it at 14:56. Not bad. The problem was I didn't realize I missed the mile marker until it was half a mile passed, so I used up extra energy to even it out. It was at mile 5.5 that I saw those familiar faces. My brother Mike, Amanda, and the kids were cheering from the sidewalk. That was such a great pick me up! High Fives for all!!! Even though this is where the course turns north, it was going south for me. Reality of the hills and quickened pace were settling in and my legs were starting to yell. It wasn't a lactic acid issue, my quads were just not happy. At this point I wasn't even near the worst hill, a 160 foot incline over 1.5 miles. It feels never ending and starts in mile 9 and so I was holding back on the pace in preparation for the hill. I was still hitting 8:00 minute miles at this point but that's because I was on the Trolley Trail route, which is mostly downhill (except Hospital Hill course planners figured out to put another short nasty hill in there). Another set of high fives from Mike & Amanda and the kiddos here, too! It was so nice seeing them on the course. They had to have gotten up fairly early to get there in time for the race. My pace dropped to 9 minute miles for this section due to the nasty of the nastiest. I walked through the aid station just to give them a little relief. Near the top of this hill I heard someone say "Hi, Scott!" It was Kyle from Twitter! Kyle gave me some motivation to get through the top of the last two hills. We chatted for a bit when Kyle took off in front of me on that last hill. Remember my diatribe about how to run a route on a measured course? I ran 13.15 miles. Pretty good, I'd say. While cooling down I also met up with Mark (yes, also from Twitter and the blog-o-sphere) and chatted with him for a while. He had finished with a mind-blowing 1:26 and was waiting for his wife to cross the finish line. Shane stopped by and said Hi. He PR'd his half marathon time, but when you are motivated to not miss your son's tee-ball game, it helps! We eventually took off for home. Shower, 1.5 hour long nap (niiiiiiiiiiice) and off to Oklahoma Joe's for lunch. I bypassed the BBQ they had at the race and opted for tradition. The more I let it sink in, I'm disappointed that I couldn't push through the last 5 to 6 miles to even finish under 1:45. When I first put this race on my calendar, I was shooting for 1:35 but that was before my trip to Bangkok entered into the picture, so I'm totally fine with missing that mark by 10 minutes. Chicago is 18 weeks away. Can I get myself down to 7:14 average pace for 26.2 miles? I'm not sure. I have a lot of work to do in those 18 weeks. My quads were a big factor in this race. Two days later they are still sore. I need to strengthen them. While Chicago has an elevation gain of 512 feet over 26.2 miles with Hospital Hill having 713 feet gain (according to my Garmin) over 13.1 miles, the pounding they are going to take at that speed is going to hurt. Enough on Chicago, I'll work on a separate post for that. The one shining light is I smashed my Hospital Hill PR by over 8 minutes and I only missed my PR by 25 seconds. When you consider I was in half-ironman shape (albeit with a broken rib) on a much more forgiving course at the time of my PR, missing it by such a small margin is pretty satisfying. (Yes, I consider myself in better shape last October). Congrats to Joe for finishing just a few clicks over 1:40. That's freaking awesome! I've got a lot to do to catch up with him.... or rather stop pushing him to train. Apparently Joe reached Pace Group 1:30, beat them up and stole their pace flag. Me in orange, Ryan in yellow shoes, and Kyle is peering over the shoulder of the guy wearing the white shirt on the right. Kyle is in blue. I stole this off of some guy on Facebook. It's the "Puzzle" board. I suppose it works but the puzzle could have been a bit more creative. Additional Note: I love reading signs that people hold up during races. They are motivating and a lot are extremely funny; however, I saw the worst sign ever on a half-marathon course. "Chuck Norris never ran a marathon". Yeah, no one on Saturday ran one either. OK folks. If you are going to go through the trouble of making a sign for a race, do a little research. We don't call running races "marathons" here unless they are truly 26 miles, 385 yards.